This move uses the heel of the hand to target some of the most vulnerable areas around a person’s head - the face, eyes and both front and back of the neck. 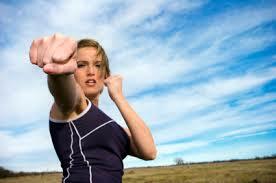 As a punch-like action it can hurt an attacker, or if you go for the eyes it will seriously disturb them. Don’t pull your arm back (keep your elbow in front of your ribs) as this will warn the attacker of what’s to come. If someone is in front of you and you've ID’s him or her as a threat (read: you've used verbal communication to try to get this person out of your personal space, or his or her hands are on you), a straight punch can be very effective. Keep in mind that aiming your punch for a vulnerable area—for example, your attacker's eyes, nose, or throat—will be most effective. Similar to the straight punch, the front kick to the groin is a powerful move to a vulnerable spot that can help you go on the offensive. This strike can give you enough of an opportunity to get away, or might catch your attacker off guard so that you're able to deliver a few more blows to other vulnerable areas, such as the eyes, ears, or throat, to finish the fight. 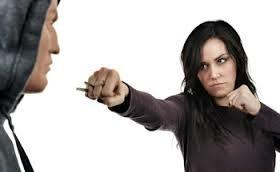 If the person is close to your body, the attacker may be too close for you to throw a straight punch. If that's the case, kicking with your knee can be very effective. 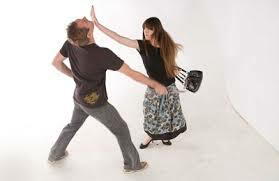 When your arm, hand or bag is pulled with force, the most important thing is to move with and use that energy - instead of resisting and pulling away, use the attacker’s energy to strike or kick them.